• SHSS12A-IND with conductor size of 70 - 185 mm² (resin volume approx 14 litres). • SHSS12B-IND with conductor size of 185 - 300 mm² (resin volume approx 28 litres). • BU1 16 - 50 mm2 conductor size mm² for SHSS12A-IND. • BU2 95 - 150 mm2 conductor size mm² for SHSS12B-IND. • SMOE 61987 with conductor size of 95 - 185 mm² (resin volume approx 42 litres). • SMOE 61988 with conductor size of 185 - 300 mm² (resin volume approx 48 litres). • BU1 16-50 mm2 conductor size mm² for SMOE 61987. • BU2 95-150 mm2 conductor size mm² for SMOE 61988. These joints are designed for use with mechanical shear bolt connectors which are included in the kit. 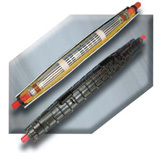 See mechanical shear bolt connectors page on the Cable Services website for details of the connectors. Tyco recommend the use of a holding tool with mechanical shear bolt connectors. • SMOE 62668 with conductor size of 95 - 300 mm² (resin volume approx 14 litres).